The Consumer Electronics Show is a wealth of knowledge concerning upcoming innovations in technology. There are several people who would be suited for speaking to these topics, but Samsung, brilliantly, decided to go with destroyer of childhood dreams director Michael Bay. Predictably, it exploded in their faces. Bay took the stage to plug Samsung’s new television — a 105-inch set that is curved to provide a more immersive viewing experience. After asking how everyone in the audience was doing (how kind? ), he said: “My job, as a director, is I get to dream for a living” — completely bypassing scripted lines for Joe Stinziano, Samsung’s Executive Vice President. Stinziano tried to recover, asking the director what inspired him. Bay began talking about how Hollywood creates a “viewer escape.” As he did, the teleprompter people scrambled to play catch-up due to his complete lack of ability to read lines off a screen, and Bay lost his place. He didn’t know how to describe what he does. Then an epiphany: Bay said he would “just wing” it. WHen Stinziano tried to prod him in the right direction, Bay took a look at the massive television and said nothing. It was at this point that Bay apologized and excused himself, exiting the stage (not pursued by a bear) and leaving Mr. Stinziano to go it alone. He apologized to the audience and continued with the presentation. Wow! I just embarrassed myself at CES – I was about to speak for Samsung for this awesome Curved 105-inch UHD TV. I rarely lend my name to any products, but this one is just stellar. I got so excited to talk, that I skipped over the Exec VP’s intro line and then the teleprompter got lost. Then the prompter went up and down – then I walked off. I guess live shows aren’t my thing. And if you’ve watched the video, you clearly saw a man excited to talk. What the teleprompter going “up and down” means? Not sure. Why he can’t articulate how his job involves telling dudes to hose down Megan Fox and detonate explosions? Not sure, either. Chill, bro. Hey, do you like cars? Yesterday we learned that Michael Bay was decked by some dude while filming “Transformers 4” because he wouldn’t pay the guy extortion money. Michael Bay got a smack down, cops came. Guys were arrested. End of story, right? Well, no. Because Michael Bay says he actually evaded the assault with his cat-like reflexes and that the assailant was an undead cadaver. Yes, the story is being passed around is not all true! Yes, some drugged up guys were being belligerent asses to my crew for hours in the morning of our first shoot day in Hong Kong. One guy rolled metal carts into some of my actors trying to shake us down for thousands of dollars to not play his loud music or hit us with bricks. Every vendor where we shot got paid a fair price for our inconvenience, but he wanted four times that amount. I personally told this man and his friends to forget it we were not going to let him extort us. He didn’t like that answer. So an hour later he came by my crew as we were shooting, carrying a long air conditioner unit. He walked right up to me and tried to smack my face, but I ducked threw the air unit on the floor and pushed him away. That’s when the security jumped on him. But it took seven big guys to subdue him. It was like a Zombie in Brad Pitt’s movie World War Z—he lifted seven guys up and tried to bite them. He actually bit into one of the guards Nike shoe, insane. Thank god it was an Air Max, the bubble popped, but the toe was saved. Then it took fifteen Hong Kong cops in riot gear to deal with these punks. In all, four guys were arrested for assaulting the officers. After that, we had a great day shooting here in Hong Kong. The place couldn’t be better. Get all that? Michael Bay karate chopped a man, threw an air conditioner into the air which exploded (while Joe Esposito’s “You’re the Best” played overhead) and then watched as the man (who was a corpse) violently threw off multiple police officers. Seems legit. 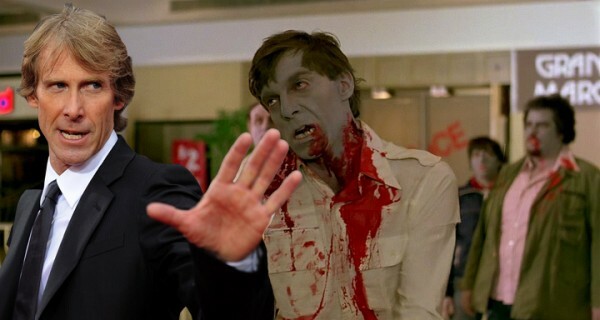 The only lingering question is whether or not this zombie was sent by Megan Fox for revenge. Michael Bay is in Hong Kong today filming the latest installment of his most famous film series, “Explosions. Computer Animation. BANG. BANG. Woman in spandex,” otherwise known as “Transformers 4,” when he was cold cocked by a two brothers trying to rob him. According to the USA Today, it all started when the brothers approached Bay and demanded he give them $13,000 (an amount big name directors routinely carry around in their pockets). When Bay said no, the elder brother body checked him and then proceeded to attack three police officers who responded. Both brothers were arrested – the older one for assault and the younger for blackmail – and Bay returned to set with some injuries to his face. 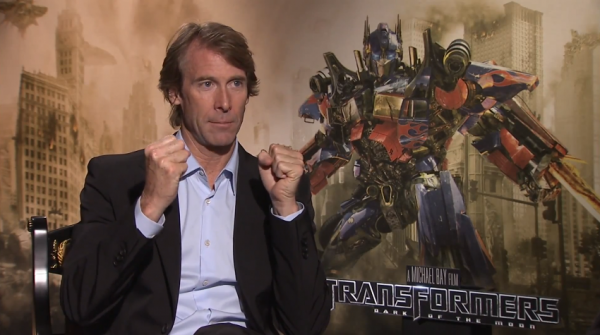 Anyone who has ever seen a Michael Bay film has probably wanted to deck the guy. It was bound to happen eventually. But this is not the way to do it. You need old-timey pants and mustaches and your dukes stretched out a foot in front of your face. That’s how you do it. Still, we’ll just interpret this to mean that early audience feedback for the flick is not very good.